One of the stats that broadcasters like to share with viewers in any close football game is the number of times a quarterback has led his team on a game-winning drive in the fourth quarter or in overtime. Will the quarterback be able to guide his team down the field for a score to win the game? These drives are often exciting but on January 3, 1993 it would take more than one scoring drive to secure the win. That was the day of the biggest comeback in NFL history. The fact that it was a playoff game only made the results more dramatic. 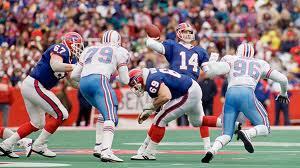 The quarterback who orchestrated this comeback was Frank Reich. He now works as the quarterbacks coach for the San Diego Chargers. It is always fun to talk about a Christian coach because not only are they vital parts of the game, but they also have a place of influence over the players that they are coaching. Anyway, back to the comeback. Jim Kelly, the Buffalo Bills Hall of Fame quarterback was injured during the regular season’s final game. That meant it was time for Reich, who in his seventh year at the time, had only started 6 games in his career. Generally, games where the backup has to replace the starter, the results are not pretty, and that looked to be the case on that cold January day in Buffalo. You can check out the highlights of the comeback and of Reich’s post game press conference in the video below – set to the music of “In Christ Alone” by Michael English which was a song Reich has been listening to in the days leading up to the game. After “The Comeback” Reich shared the lyrics of a worship song he had been listening to. 1- In Christ Alone – “In every victory, let it be said of me that my source of strength and my source of hope is in Christ alone.” I do not believe that God decides which team wins football games. I do believe that He gives us opportunities in successes and in failures, to depend wholly on Him and to choose Him to be the source of strength and hope. All the things of this world, material possessions, as well as fame, status etc. is very fleeting. To pour our energy into the pursuit of those things will not be fulfilling for us. Fulfillment only comes in living for God, understanding His role as our Savior and seeing Him work in our lives. He may grant success in this life, and we, like Reich, can choose to honor Him and share what He has done. 2- God loves incredible stories – The Bible is full of stories of people doing incredible, impossible things because God is working. 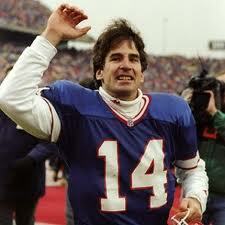 Reich was second string, behind a future Hall of Fame quarterback. He had started on average less than 1 game per season in his career up to this point. And his team trailed by as many as 32 points in the second half. And yet, this comeback is his professional legacy. What’s more amazing is that it wasn’t even the first time he experienced something like this. To have done it in college, too again as a back-up QB leaves little doubt that it could be anything other than God wanting to draw attention to a guy who would use this notoriety to share what God means to Him. I am challenged to realize every day the amazing things that God is doing in my life and to use those opportunities given to me to share His love with others. Did you see where he was just promoted to offensive coordinator? Cool! I didn’t see that news until you let me know. Thanks for the update and congrats to Frank Reich!